Over the last year, I have written up many posts on Corning Ware patterns in order to provide some semblance of a record for the online community. The whole idea stemmed from the myriad patterns I kept running into during my quest for my own favorite pattern, being "Wheat". There has been one pattern, however, that has eluded me over the last year... Actually, it has been eluding me since 2007 when I first found out about it. Renaissance. The limited edition Gift Line pattern from 1970. The pattern is a copy of an old etching of Stockholm's seaport with victory arch in the book Suecia Antiqua et Hodierna written by Erik Dahlbergh around the middle of the 17th century. The enamel color chosen by Corning to replicate the etching is referred to as Miniver Grey. The last piece in the collection is the 9 cup stove top percolator (P-149) which features the Cathedral located on the left side of the tray. and then continues the etching all the way around the back side.... Giving you the complete picture. I did get the wood handled cradle with the P-84-B, which is how it originally came. The smaller saucepans were paired with the chrome "Royal Buffet" candle warming cradles. I don't particularly care for the wood handled cradle with this pattern, as it covers up too much of the design. I will probably opt for the Platinum Cradles when I use my Renaissance pieces. Which will only be for "uber" special occasions. I also have found the Renaissance design. I have the tray and recently found the coffee pot in an antique shop in Florida. Thanks to you I now know more about this design and know that I need to keep looking for the other pieces. Great info. Thanks. I will go ahead and add the photo to the post.... Sorry for the delay. I have located the percolator at a neighboring thrift store. Do you still need it? I, personally, do not need a percolator at this point, but I know several people who are looking for one. May I ask how much they are asking for it? Shane, where did you find a reference to the scene being a Swedish seaport? I haven't been able to dig up any citation, official Corning or otherwise. 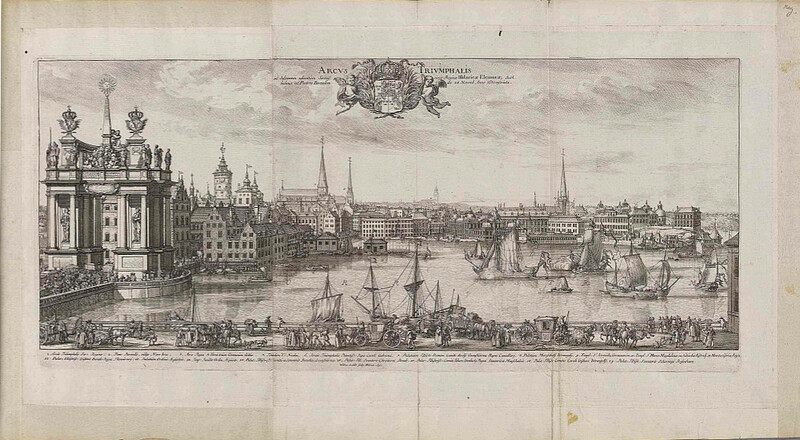 In fact the scenes are lifted from a 1691 etching of Stockholm Harbor in "Suecia Antiqua et Hodierna" by Erik Dahlbergh. The Suecia collection was, essentially, a royal advertising project commissioned to extol the imperial virtues of Sweden. It is quite fun to compare the cookware with the original etching. Notice, for instance, that the platter bears only about two thirds of the full scene, and that the percolator has portions of the full scene that are not on the platter. How is it, do you think, that late 17th century royal Swedish propaganda came to adorn mid-20th century proletariat cookware (albeit molded from one of the most technically advanced ceramic materials ever created)? The identification as a copy of an etching of a "Swedish Seaport" comes from a collectors book titled "Corning Pyroceram Cookware" by Debbie and Randy Coe. A specific city is never identified, nor was the source of the etching. I find this absolutely fascinating! I have been racking my brain and viewing photos of Swedish cities for months, trying to extrapolate which port city was depicted by the etching. I was beginning to think that there was some poetic license taken with Upssala. Thank you for this information. I suspect it has more to do with events at Corning. Jamie Houghton is retired now from the top spot at Corning but he does still sit on the board of the Glass Museum. I'll bet he knows who picked out the pattern for the limited edition set and probably also who it was that donated the "Suecia antiqva et hodierna" to Harvard. If so I'm sure there's a lot of detail he could fill in. Of course, it could just have been some graphics technician in the marketing department. I had all but the percolator in the Renaissance pattern. I enjoyed them for a few years and then decided to sell them in my then eBay store. Someone actually contacted me to say I should keep and not sell the Corning Renaissance. I am using a Platinum Filigree Percolator now and love it! Thanks so much for the information on the "correct lids." I think this is not a well known fact as the ones for sale at such high prices do not have the correct lids with them. I will now keep looking for ones with the correct lids. I certainly would appreciate any info that you receive on this rare design.